nope, this doesnt work - it wont update items right after installation - time is counting and all but if I tap a button to toggle a light then the button state is not updated, I have to manually refresh the page to update. Hardware support is disabled, all other settings at default, addresses are all correct like in my previous postings. Maybe a bug you overlooked? Guys, I could use some help running the app. Reading through this entire post it looks like a webview issue. Is that fixable on a rooted device? but the the app does not choose the newer google version. @Norm, all the normal HABPanel functionality (clicking buttons, updating values ) is completely handled by the embedded webview component. None of my code is involved for this. So it is unlikely that this is caused by a bug in my code. Grab an adb log and send it to me and I will check if I can see something in there. @xsherlock, an app can not choose the webview version itself. It is a setting in the android developer settings. If you update to 0.9.20, Status Information additionally shows which of the available webview version is used. How do you change that setting, I cant see that in settings/developer options from the device level menu, should I change it from the ADB over USB? any how to? The google play store is still serving 9.19 I see 9.20 app-debug.apk in the github/releases is that a file to install? That does not install on my device, says app not installed. Looks like what I told you is wrong. From reading on the internet, selecting the webview implementation in the settings is only available starting with Android 7. In Android 6, there should only be one webview version, and that is the one installable and updateable as a standalone app. I have no idea how you got 2 versions on your tablet. To me, It looks like there is a problem in the android version on your tablet. If HPV is really showing it is using the old webview version, you may try to contact the Sibo support. See this similar thread about the same problem on Odroid C2. Regarding the update issue: did you uninstall the HPV version from the play store before installing the apk? with 9.20 I can see what was suspected that it is hard using the outdated webview. I spent substantial time researching the behaviour of webview and I’m very confused how it should behave in Android 6.0.1. Sibo support is rubbish, for every question the salesdroid will write in a broken english that this is how it is and they are sorry it cant be changed. I’m 99% sure he didn’t even bother to ask the software guys. Same for the warranty claims as I already have couple units dead. If only anyone else in a word would produce a POE tablet with flush mounting with a wall I would switch in a blink. yes, I do know that. And, on a final note, also Fully Kiosk Browser stopped working after two days - totally frozen. 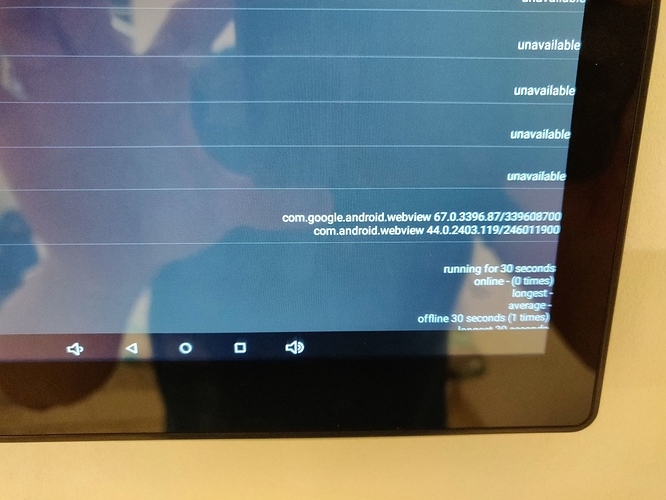 Anyway, I will have a search if there is any Android 5.x ROM out there somewhere, I guess this is the only way to get hold of a new webview component. If I don’t succeed then I will consider buying new tablets for my “smart” home. I wonder what exactly the openHAB team changed since the last update and why - this is not only me but others too who are affected by this. And I will have to spend a lot of money on new tablets because of this. Thanks for the support, Volker. Funny note: I reset the tablet again and installed HPV from the app store - it shows the time just fine but does not update the buttons and items and so forth. Fully Kiosk Browser updates the buttons and items just fine and with very little lag but does not show the time continously - it freezes after a while (sometimes minutes, sometimes hours). At the moment I help myself with HPV (which I really like) and use the SCREEN_ON command - I assume HPV then refreshes the screen, so all is good. This gives me time to search for alternatives. Is there something I can check? Also, Is there an option to turn on the tablet when a motion is detected without using an OpenHAB rule to send a remote command to turn the screen on using the motion detection item? The app only reports motion when it first detects it by closing the contact. If no further motion has been detected in a period of 30 seconds, the contact will be opened. This repeats every time new motion has been detected. I have added a todo to describe this in more detail in the help file. I cannot get the application to send any update to the item. I start the application, the application update the item to CLOSED and then nothing happens ever except If I restart the application. According to the system information screen, the tablet detect motions correctly. 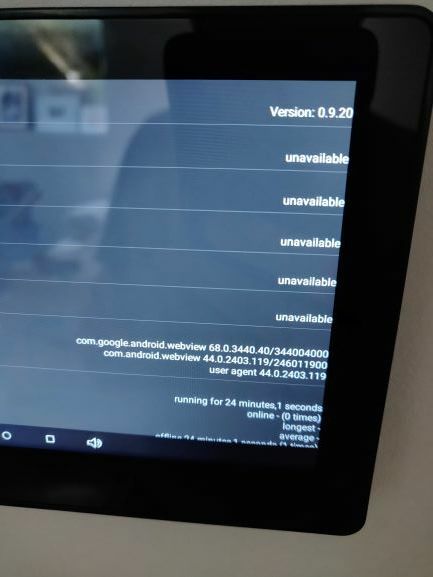 I have also tried to install the application to another tablet (Kindle Fire 7) but the status in the menu always stays to “not connected” even If I have the welcome screen of openhab displayed. Do you have any idea why it detect it as not connected? Edit: sorry, it’s working on my first tablet but the delay between the CLOSED and the OPEN is 1min and not 30 sec. Have you looked at the wiki page for commanding? It describes a few things to do/check if commanding does not work. That should also apply to failed connections. HPV runs quite nicely now but I encountered a crash while sending SCREEN_ON to it. I programmed my house ghost to send the SCREEN_ON command (with sendCommand) whenever it detects motion via a Fibaro motion detector. Most of the times this works perfectly but one out of twenty times the tablet crashes, leaving a blank screen with just the background LEDs on. The tablet needs to be rebootet the hard way in this case - nothing else works. Any ideas how to fix this? Not without a log file. A logfile from what (HPV, openhab, android…) and how do I do that? I read your wiki pages and what not but no mentioning a log or debug function. An ADB log. Google for instructions on how to geht one. Please update to 0.9.20. It contains a fix for the START_APP command. Awesome! It worked! Any idea when that version will hit the play store?